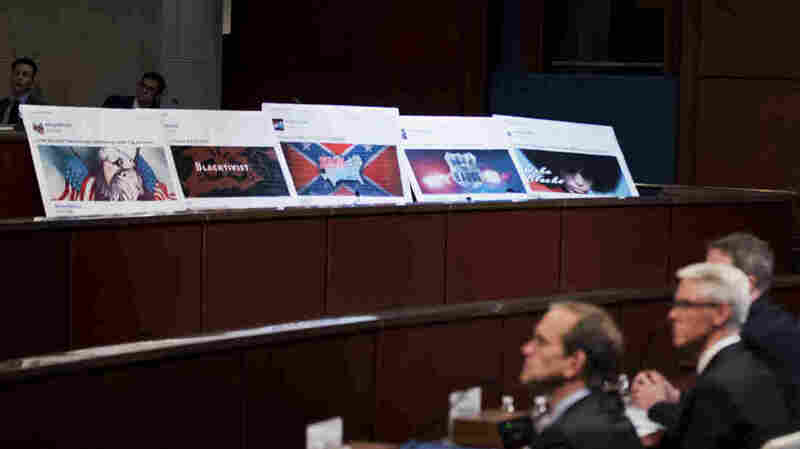 Facebook, Twitter And Google On Capitol Hill For More Russia Interference Questions Facebook, Twitter and Google faced questions from the Senate and House Intelligence Committees on Wednesday, revealing more than ever about last year's Russian interference campaign. Facebook ads linked to a Russian effort to disrupt the American political process are displayed as, from left, Google's Kent Walker, Facebook's Colin Stretch and Twitter's Sean Edgett, testify during a House Intelligence Committee hearing on Wednesday, Nov. 1, 2017. One Facebook group, the "Heart of Texas," posted anti-immigrant and anti-Muslim content, then began promoting an event on May 21, 2016, marketed to "stop the Islamization of Texas." A second group, "United Muslims of America," also began advertising an event to "save Islamic Knowledge" — across the street from the "Heart of Texas" rally. Combined, the advertising and social media campaign cost about $200, but created a tangible show of polarization that brought out crowds and received news coverage. "I'm certain that our adversaries are learning from the Russian activities and even watching us today," Burr told the witnesses. "Simply put, you must do better to protect the American people, and, frankly, all of your users, from this kind of manipulation." The House Intelligence Committee released a small sample of some material that Russia was pushing on Wednesday afternoon. They take on a number of issues, but mostly focus on amplifying controversy within American culture. One refers to Democratic presidential nominee Hillary Clinton as "Killary Clinton." Another says "racism won, ignorance won, sexual assault won" in reference to President Trump's election victory. Others purported to support gay rights and better treatment of Muslims in America. The House Committee's ranking Democrat, Rep. Adam Schiff of California, said no matter who creates this kind of material, social networks' business model is based on exciting and inflammatory content. "These algorithms, which are designed to attract our attention and keep our eyes focused on the platform for advertising purposes, may also have the unintended consequences of widening divisions among our society — polarizing people," Schiff said. Schiff pushed the tech witnesses on whether they had an interest in letting users know if they saw or were targeted by Russia-backed content. The companies demurred; Facebook general counsel Colin Stretch pointed out how technically difficult that would be, because his company's numbers were calculated based on modelling and not by counting each individual Russian-backed post or ad. The two hearings Wednesday followed a Tuesday session before the Senate Judiciary subcommittee where representatives of the three technology companies also testified. Wednesday's were more heated. Many lawmakers wondered aloud why they were talking to the general counsels for the companies, instead of the CEOs. Others complained that Big Tech had dragged its feet in responding with too little, too late. "I have more than a little bit of frustration that many of us on this committee have been raising this issue since the beginning of this year and our claims were frankly blown off by the leaderships of your companies," said the Senate Intelligence Committee's vice chairman, Mark Warner, D-Va.
"Candidly, your companies know more about Americans than the United States government does and the idea that you had no idea that any of this was happening strains my credibility," Warner also said. Google, Facebook and Twitter said they were sympathetic, but would not completely commit to supporting legislation that would regulate transparency for political ads on their platforms. They did say they agreed that more transparency is needed. But the companies want to comply on their own.